In 1947 the musicologist Adriano Belli founded the Spoleto Opera Theatre with the aim of promoting the profession of opera for young people with skills and opera lovers. This is possible thanks to a preparatory course of two years for the winners of the competition for young opera singers of the European Communities. The winners are prepared by a course of five months during which they are taught several lessons: diction, mime, acting in addition to perfect speech. After five months, depending on the capabilities of each student, the artistic director of the theater assigns different roles to which the young singers will perfect their studies. 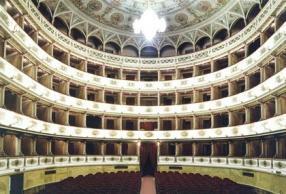 Each year, the Experimental Opera Theatre hosts the Spoleto opera season, with the big names of international opera scene.